The Sofia Half Moon Clutch is the perfect addition to any outfit.The design features a zipper closure with a suede tassel. The style lays flat for easy packing and seamlessly transitions from day to night. Love this clutch for the spring/summer timing! Perfect size and holds phone/keys etc. This clutch will match with everything! Can't wait to bring this on vacation this spring!! Cute clutch at a great price point! Roomy without being too big. Can’t wait to use when the weather warms up! I bought this clutch for my Honeymoon in December and can't wait to use it. I can already tell that it is going to be the perfect size and such a cute addition to my evening outfits. This reminded me of a simple straw placemat folded in half. I was not impressed. This is the perfect summer clutch for any outdoor or special occasion. It is the perfect size for your phone, lipstick, and a slim credit card wallet. It’s shape makes it easy to carry when mingling. Great price point and very packable -brought to welcome drinks at the beach! I bought this clutch as a present for a friend's birthday- I fell in love when it arrived and had to order several more (including one for myself)! Will be my go-to clutch for the rest of the summer. The perfect clutch for any summer outfit! Great size too! So cute for the price! I took off the tassel because it looks cheap and added my own to elevate the look. It was perfect in Maui! Great clutch!! Literally goes with everything, roomy enough to hold everything you need for an afternoon or evening out. Have been carrying every day this summer! This half moon clutch has been a perfect complimentary piece to all my summer outfits! It is very well made, much sturdier than expected, and fits several items without it being bulky. Highly recommended and you really can’t go wrong at this price point! This is the cutest clutch for summer and is perfect for day or night. It fits everything you need without bulking up. The only thing I don’t love about it is the lack of inside pockets, but that’s what keeps it from getting too bulky. Unbeatable bag, especially for the cost. This clutch is great for the summer - it's so easy and packable and fits so much! It goes with everything - highly recommend. This bag is incredible! The price is obviously the biggest selling point but it’s actually great quality and fits a ton of stuff (cell phone, lip gloss, sunglasses). I’ve worn it for Day and night events this summer and it matches everything! It’s just the right size and easy to carry. This is the perfect summer clutch! It goes with everything and big enough to fit my phone, lipstick, and cards! Perfect purse for vacation or nights out on the town! Can fit small wallet, phone, lipstick, and keys. Used it immediately when I got it! Perfect for a casual summer date or girl's night out! Too casual for black tie but can still work at most summer gatherings! I’ve carried this clutch to brunch, weddings, nights out and it works with everything! It’s the perfect size and great quality. I get so many compliments every time I carry it and I know I’ll carry it all summer! Perfect clutch for going to dinner or going out. Received so many compliments!! Holds a credit card, phone and keys easily. I'm in love with this clutch! I've already it paired it with a couple of summer dresses and I just can't get enough with how perfect it is. Its the right size for carrying my cellphone and a few other items. I love that the natural color goes with just about anything and I can either dress it up or down. Add a cute summer hat, your outfit it complete. Totally recommend this clutch! Very versatile and goes with many of my summer outfits. Love that I can dress it up or down. Great size for my essentials! I gave these clutches to my bridesmaids with a white grosgrain ribbon when asking them to be in my wedding. I love them! The perfect little gift for summer. The half moon clutch is the perfect summer accessory. The straw looks so cute and summery for daytime fun and nighttime fun. It is large enough to hold my phone, my wallet, and my lipstick without bulging. It's one of those "can't go wrong with" pieces. I highly recommend it. The half mood clutch is just perfect! It holds plenty of my most important things and a beautiful natural touch to my outfitt!! Absolutely goes with every Summer outfit! !So light & fun!Great price point, as well! Was purchased to be used for wedding season. Has ended up being my summer go to bag. Can hold all of the essentials + more. Would def recommend. Great quality!! Great size! It fits much more than you would think & is perfect for the summer. This is so cute and a great size to hold a lot of essentials. I was very happy when I received this clutch. It's a perfect size and feels like it's good quality. 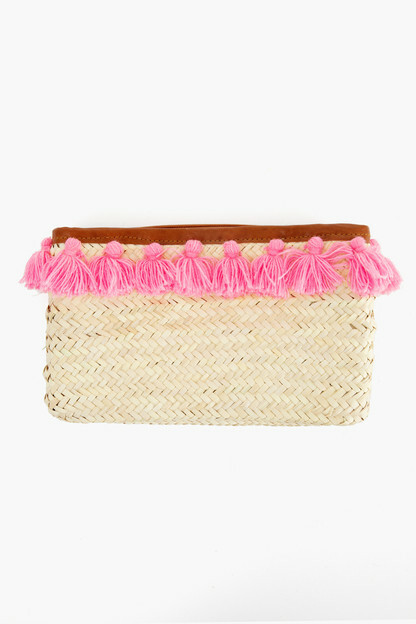 It will be the beachy clutch for my upcoming vacation! Absolutely amazing for summer! Can't wait to bring it to the beach! Such a cute accessory for summer. Holds a lot more than you would thing. Will be my go to summer clutch. This purse was bigger than I expected, traveled so well (again, not what I expected, given the material) and was absolutely perfect for my trip to Charleston! love this half moon straw clutch. get so many compliments on it. perfect for spring and summer events!! It was so much bigger inside then I thought it would be! I could fit my keys, wallet and phone! Absolutely love it! No interior pockets or anything but does the trick and totally adorable.... you can fit a surprising amount of stuff in here. Looks just as great in person as it does online. Will be adorable with sundresses this Spring! It's a beautiful, affordable clutch! It's a more subtle way to take part in the wicker handbag trend. This clutch is an absolute steal! Perfectly holds my phone, keys & lipgloss for a night out! The first time I used it, all my friends were raving about it! Such a lovely bag! Goes with everything. This clutch is very on trend for a great price. Exactly as pictured online. It is the perfect size. Excited to take it with me on my honeymoon in Capri this summer! The clutch is adorable for spring and summer and is a perfect size (it fit my phone, keys, cards, and a few makeup items). The only downside is that because of the shape, you have to be careful when opening it so things don't spill out of the sides. Overall though, I love it! Love this bag. 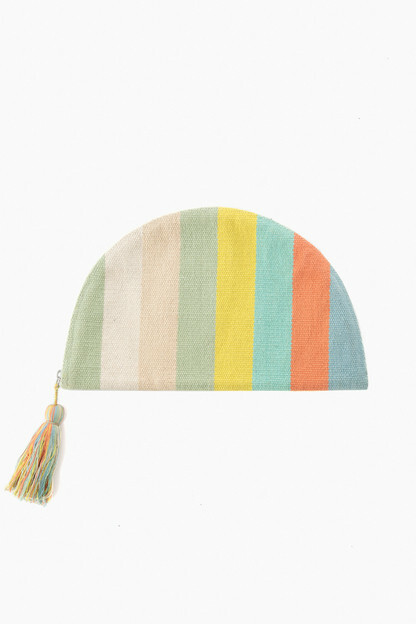 The tassel doesn't look as high end as in the picture, but still really cute. Love this cute little clutch for summer time. Big enough to hold all the essentials but fits comfortably under your arm. 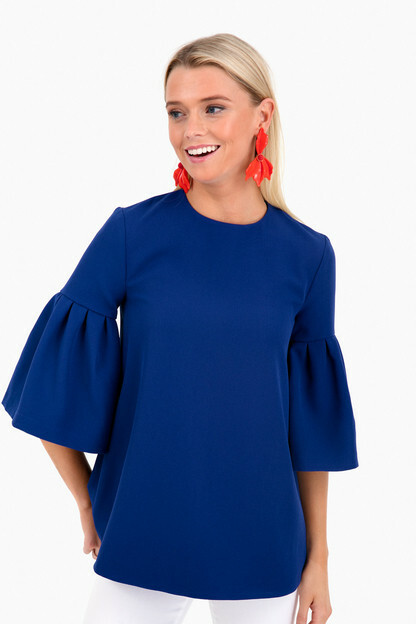 The tassel is a cute addition too! For the price, you can't go wrong. Clutch is a great size. There was one loose string which I tucked in but overall great purchase and pretty. This clutch is perfect for the spring and summertime! It is much roomier than it looks on the pictures with plenty of space for all your necessities! Great clutch that matches everything. Can't wait to pair it with tons of outfits! This purse is so cute and pulls every outfit together! The tassel adds just the best extra touch. I can't wait to carry it with my summer dresses. Will be using it a lot this spring/summer. I saw this bag on The Classy Girls Wear Pearls blog, and for the price said to myself I must get this. I am very pleased with the quality and the amount the inside can hold. Phone, car keys, small wallet, lipstick all fit easily. I find it very stylish too, and it will go with everything this spring and summer. And of course the tassle is fabulous! This clutch is super cute and the perfect size! I will definitely be using it a ton this summer. I would definitely recommend it!! I love the clutch! It appears to be good quality and will fit all of my things. I've been using a leopard fur clutch for winter and I can't wait to switch to this one for spring! The clutch turned out to be a bit bigger in size than I was expecting but I acutally think that I will get more use of the larger size. It is the perfect for a wide range of summer events! Not too small - will fit keys, phone, lipstick, etc. Versatile and can't wait to use it all summer long! It's a bit larger in size than expected, but good value for the price point. I was a little hesitant when I ordered this clutch given the amazing price. However upon arrival, quality was in no way an issue. This bag will be the perfect spring break and summer evening bag! Specious for all necessities and neutral enough to pair with just about anything, I am so happy I added this to my collection. This clutch is the must have piece of the spring and summer season. It is good quality and matches nearly everything in my wardrobe. Love!! This clutch is so perfect for spring and summer. It is a great size, great quality, and equally great prices! I bought this clutch for our honeymoon in Greece and it's perfect! The size is ideal for phone, ID's and cards, plus a few other extras like lip gloss and a small comb. The material is a rough straw but it doesn't look cheap. I would definitely recommend this! 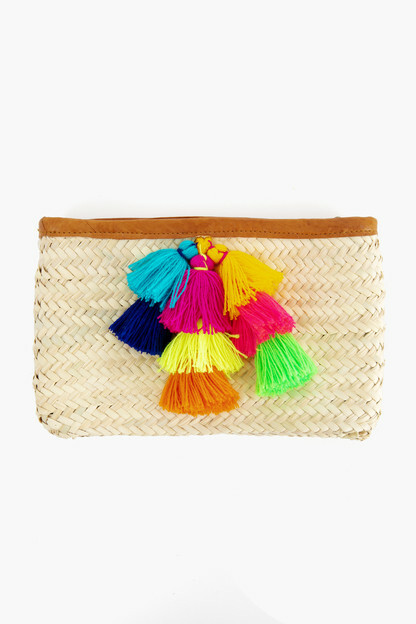 This clutch is great for spring, especially with straw being such a huge trend this year. It's not super sturdy, but for the price, you can't beat this fun addition to your spring wardrobe. 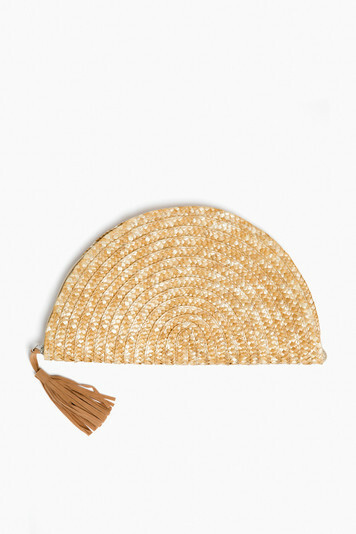 Love this clutch - the tassel is really cute, it's plenty big for what you need for a day or evening out. Great for spring/ summer!! This clutch is so cute and perfect for this summer. It packs well in a suitcase and is big enough to fit the essentials, yet it isn't huge. I will be using it all summer long! Such a cute bag! large enough to fit all the essentials. Love Love Love!! Even more gorgeous in person and plenty of room! Super cute! The bag is much roomier than I expected. A great nuetral to carry all summer. Wow!! I love this clutch! The price is right, the quality is great, and the product is PERFECT for my upcoming trip to Mexico!! I love this purse! Lots of room to store my essentials plus looks great with my spring-inspired outfits. Get lots of compliments when I take it out and about with me.